Break the Ice for Special Olympics Nebraska! It’s that time of year again where warm-hearted people take a very cold dip for a good cause. The Law Enforcement Torch Run for Special Olympics Nebraska is excited to announce our 2019 Polar Plunge season! The Polar Plunge is an annual event that challenges participants to show support for Special Olympics Nebraska by plunging into a lake - in the dead of winter. 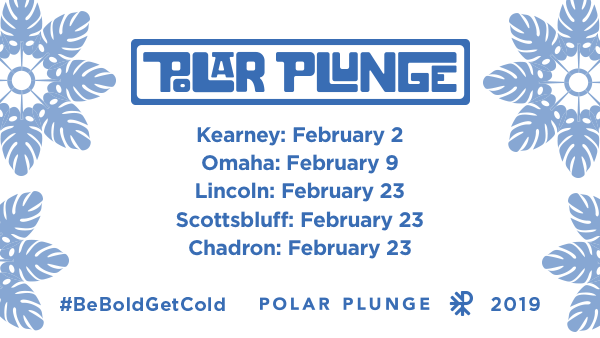 Plungers are encouraged to form teams, dress in costume and share their experience by using the hashtag #BeBoldGetCold. Those brave enough to run into the icy waters raise money by collecting pledges from family and friends. Prizes are awarded for creativity and fundraising. Check out the Polar Plunge tabs on the left-hand side of the page to find information about how to sign up, start fundraising efforts and maximize your Plunge experience! Still have questions? Reach out to Katie Kellar at kkellar@sone.org or 402.331.5545x17.